In a response video posted to his channel yesterday, De La Haye expressed his frustration with the situation. “I’m definitely torn apart inside,” De La Haye says. “I didn’t feel like they [the rules stated in the NCAA waiver] were fair…. I just didn’t think it was fair what they wanted me to do, so I told them I wouldn’t do it.” Due to his ineligibility, De La Haye also lost his scholarship to UCF. The “Deestroying” channel has videos covering a variety of topics including football, fitness training, and “story time” videos detailing some of De La Haye’s personal life stories. In total, the channel has just shy of 5 million views and about 96,000 subscribers. 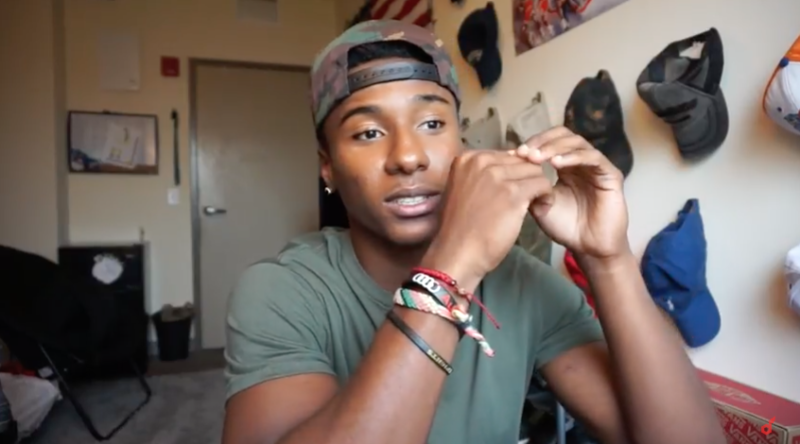 De La Haye posted his first video to the “Deestroying” channel in May 2016. The channel’s growth over the past year has been solid, but it’s not as dramatic as the millions of subscribers some YouTube channels have gleaned recently in just a few months’ time. It’s hard to estimate how much money De La Haye currently makes from his channel if he monetizes all his videos. Social Blade, a website that tracks the performance of social media accounts including YouTube, Twitter, and Instagram, estimates De La Haye could make anywhere between $252 and $4,000 per month with his YouTube account as it currently stands. Creators can choose to demonetize specific videos on their channel even after they’ve opted-in to monetize the channel as a whole. Some creators do this frequently for videos that discuss sensitive topics like suicide or other issues that the creator doesn’t feel right profiting from—but De La Haye’s argument is that he shouldn’t have to do that at all. “They wanted me to give up the money that I made, which is crazy. I worked so hard for it…. I’m passionate about this video stuff, so I’m giving it my 110 percent,” he says. The NCAA has consistently come down hard on athletes who find ways to make money with their talents. Athletes have been suspended for selling their own merchandise and autographed memorabilia, and the NCAA forbids college athletes from accepting endorsement deals that could help them pay for their careers as a whole. Athletes have challenged this stance in the past. Back in 2002, Olympic skier and University of Colorado football player Jeremy Bloom sued the NCAA so he could keep his skiing career, and the endorsements that came along with it, while playing football at his university. And former UCLA basketball star Ed O’Bannon continues to lead an anti-trust case against the NCAA over the organization using athlete likenesses for profit in things like video games. Either way, the NCAA doesn’t want De La Haye, or any student athletes, profiting off their athlete status on any social platform or within other business ventures. Social media is the next frontier for student athletes to make money on their own terms. Sponsored posts on social media outlets are nothing new, but that means the NCAA will have to follow student athletes’ activity on all those fronts. YouTube, similarly to Instagram, has both the fortune and misfortune of being a permanent visual diary of sorts, available for anyone to see and scrutinize. But the NCAA may have a more difficult time policing student athletes if and when athletes turn to another outlet, like the ephemeral Snapchat.